Use mb option for this. mb stands for Make Bucket. In the above example, the bucket is created in the us-east-1 region, as that is what is specified in the user’s config file as shown below. If the bucket already exists, and you own the bucket, you’ll get the following error message. make_bucket failed: s3://tgsbucket An error occurred (BucketAlreadyOwnedByYou) when calling the CreateBucket operation: Your previous request to create the named bucket succeeded and you already own it. If the bucket already exists, but owned by some other user, you’ll get the following error message. make_bucket failed: s3://paloalto An error occurred (BucketAlreadyExists) when calling the CreateBucket operation: The requested bucket name is not available. The bucket namespace is shared by all users of the system. Please select a different name and try again. Under some situation, you might also get the following error message. make_bucket failed: s3://demo-bucket An error occurred (IllegalLocationConstraintException) when calling the CreateBucket operation: The unspecified location constraint is incompatible for the region specific endpoint this request was sent to. To create a bucket in a specific region (different than the one from your config file), then use the –region option as shown below. Use rb option for this. rb stands for remove bucket. The following deletes the given bucket. If the bucket you are trying to delete doesn’t exists, you’ll get the following error message. To delete a bucket along with all its objects, use the –force option as shown below. To view all the buckets owned by the user, execute the following ls command. In the above output, the timestamp is the date the bucket was created. The timezone was adjusted to be displayed to your laptop’s timezone. The following command displays all objects and prefixes under the tgsbucket. PRE stands for Prefix of an S3 object. To display all the objects recursively including the content of the sub-folders, execute the following command. Note: When you are listing all the files, notice how there is no PRE indicator in the 2nd column for the folders. If a specific bucket is configured as requester pays buckets, then if you are accessing objects in that bucket, you understand that you are responsible for the payment of that request access. In this case, bucket owner doesn’t have to pay for the access. To indicate this in your ls command, you’ll have to specify –request-payer option as shown below. In the following example, we are copying getdata.php file from local laptop to S3 bucket. For the local file, you can also specify the full path as shown below. If you like to upload the data folder from local to s3 bucket as data folder, then specify the folder name after the bucket name as shown below. To download a specific file from an S3 bucket do the following. The following copies getdata.php from the given s3 bucket to the current directory. 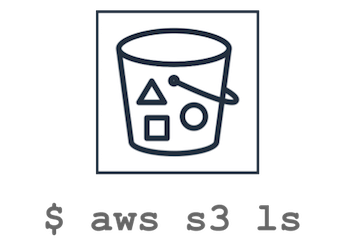 $ aws s3 cp s3://tgsbucket/getdata.php . You can download the file to the local machine with in a different name as shown below. Download the file from S3 bucket to a specific folder in local machine as shown below. The following will download getdata.php file to /home/project folder on local machine. The following will download all the files from the given bucket to the current directory on your laptop. If you want to download all the files from a S3 bucket to a specific folder locally, please specify the full path of the local directory as shown below. In the above command, if the tgsbucket folder doesn’t exists under /home/projects, it will create it automatically. The following command will copy the config/init.xml from tgsbucket to backup bucket as shown below. In the above example, eventhough init.xml file was under config folder in the source bucket, on the destination bucket, it copied the init.xml file to the top-level / in the backup-bucket. If you want to copy the same folder from source and destination along with the file, specify the folder name in the desintation bucketas shown below. If the destination bucket doesn’t exist, you’ll get the following error message. The following will copy all the files from the source bucket including files under sub-folders to the destination bucket. When you move file from Local machine to S3 bucket, as you would expect, the file will be physically moved from local machine to the S3 bucket. As you see the file doesn’t exists on the local machine after the move. Its only on S3 bucket now. The following is reverse of the previou example. Here, the file will be moved from S3 bucket to local machine. As you see below, the file now exists on the s3 bucket. Move the file from S3 bucket to /home/project directory on local machine. After the move, the file doesn’t exists on S3 bucketanymore. Before the move, the file source.json is in tgsbucket. This file is not in backup-bucket. Move the file from tgsbucketto backup-bucket. Now, the file is only on the backup-bucket. In this example, the following files are under data folder. In this example, the localdata folder is currently empty. The following will move all the files in the S3 bucketunder data folder to localdata folder on your local machine. Here is the output after the above move. Use the recursive option to move all files from one bucket to another as shown below. To delete a specific file from a S3 bucket, use the rm option as shown below. The following will delete the queries.txt file from the given S3 bucket. When you specify rm option just with a bucket name, it doesn’t do anything. This will not delete any file from the bucket. To delete all the files from a S3 bucket, use the –recursive option as show nbelow. When you use sync command, it will recursively copies only the new or updated files from the source directory to the destination. The following will sync the files from backup directory in local machine to the tgsbucket. If you want to sync it to a subfolder called backup on the S3 bucket, then include the folder name in the s3 bucket as shown below. Once you do the sync once, if you run the command immediately again, it will not do anything, as there is no new or updated files on the local backup directory. Let us create a new file on the local machine for testing. Now when you execute the sync, it will sync only this new file to the S3 bucket. This is reverse of the previous example. Here, we are syncing the files from the S3 bucket to the local machine. You can also make S3 bucket to host a static website as shown below. For this, you need to specify both the index and error document. For this to work properly, make sure public access is set on this S3 bucket, as this acts as a website now. When you presign a URL for an S3 file, anyone who was given this URL can retrieve the S3 file with a HTTP GET request. For example, if you want to give access to the dnsrecords.txt file to someone temporarily, presign this specific S3 object as shown below. The output of the above command will be a HTTPS url, which you can hand it out someone who should be able to download the dnsrecords.txt file from your S3 bucket. The above URL will be valid by default for 3600 seconds (1 hour). If you want to specify a short expirty time, use the following expires-in option. The following will create a presigned URL that is valid only for 1 minute. –expires-in (integer) Number of seconds until the pre-signed URL expires. Default is 3600 seconds. If someone tries to access the URL after the expiry time, they’ll see the following AccessDenied message.